Looking for private in-home or in-studio Organ lessons? Our Brandeis teachers are ready to get you started. Find your teacher today! I started taking music lessons at the age of 9. It began playing in the church and then I taught lessons in my home at the age of 16. I went on to attend and graduate from Christian Heritage College (now called San Diego Christian College) with a Bachelors Degree in Music and Business. I am now the Director of the Music Department at San Diego Young Artists Music Academy. I direct two youth and children choirs, a male chorus and a great adult choir. I also sing with the Voices of Prayze who travel with Jason Mraz from time to time. As a singer, pianist and as a teacher, I specialize in Gospel piano & vocal technique and repertoire. I also have a great deal of experience in Pop, R&B, and Classical so I am able to help students excel in these genres as well. nd rewarding experience – having fun is part of my lesson plan. My goal for each student is to build confidence through knowledge and experience. I will encourage each student to reach into their spirit and bring out what is already inside of them through the type of music that brings them happiness. After 3- 6 months of lessons from me pianist will be able to know beginning concepts, play songs of their choice by ear and note read simple songs also. Singers will know beginning vocal exercises, be able to project their voice, and sing high and low notes accurately to songs according to their ability. It was great! We determined the lowest I could sing as well as about the highest I can sing. She found a good key for my voice, showed me some breathing techniques and picked out another middle range song for me to sing! Can't wait for the next lesson!! Judy is a gifted and experienced artist and teacher who shares generously of her talents. More importantly, she has an open, kind and VERY positive way, which encourages our child to open up. Lesson day is the best day of the week for us!! Judy is very pleasant and patient. Sensed my (beginner) level right away, is helping me understand and play chords. Added Gospel run today and transposing - new to me for organ! Step by Step, bite sized lessons for church, gospel or general music. Learn how to play from a Hymnal, Read Sheet Music or Lead Sheets or pick-up any song that you hear in any key. May choose traditional lessons and/or ear training (see ear training for details). Jump Start Seminars and group classes also available at special rates. to determine where to start and periodically to know how to continue. (The kids just think they are games). I teach how to play with soul! 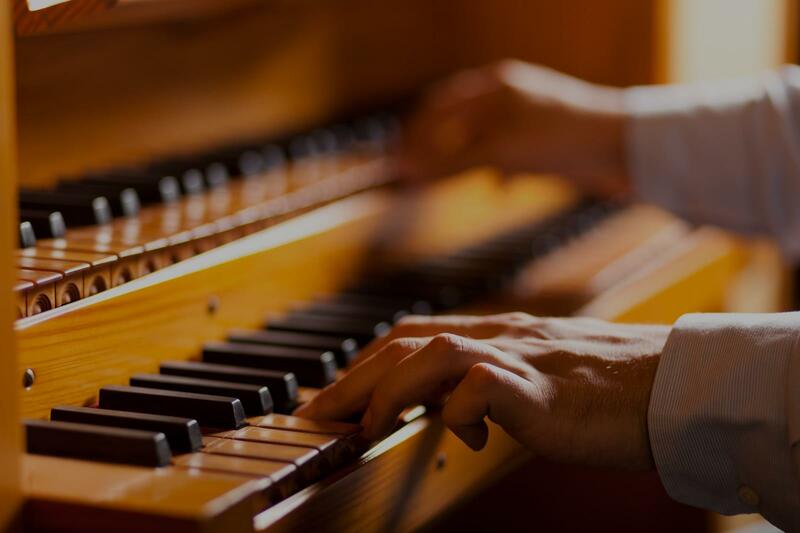 The pipe organ is a complicated, yet beautiful instrument to master. As such, beginning students must have attained an intermediate to advanced level of proficiency on the piano in order to study the pipe organ. Please contact me to discuss your interests in more detail. Lawrence loves to teach music, especially piano and organ. He began studying the piano at age 5; by age 12 he was studying the pipe organ and performing at church services in his hometown of Springfield, Illinois. A graduate of the Interlochen Arts Academy in Michigan and the University of Massachusetts in Boston, he has continued his private musical studies throughout his adult life with distinguished faculty members from the Cornell College School of Music, the Shenandoah Conservatory of Music and the Winthrop University Conservatory of Music. Presently, he teaches private music lessons in Rio Rancho and Albuquerque, and is the Director of Music & Liturgy at Church of the Incarnation in Rio Rancho. He is a member of the American Guild of Organists. Very personable and seems to be a good fit with our 6 year old. Were looking forward to our next lesson. Experience the awesome power of the King of Instruments! No prior keyboard playing skills are necessary. ASK ME about special pricing for families! Hello! I'm Laurel, and I would love to help you or your child unlock your musical abilities! Complete beginners, intermediate or advanced students, even working professional performers - no matter where you are on your musical journey, I will work with you to develop and hone your skills. I believe in a personalized approach to teaching, based on building a relationship with each student. I place equal emphasis on achieving your long-term goals and enjoying the process of learning and making progress. With my expertise and your hard work, we’ll set goals that you’ll be excited about, and we’ll work towards them together. Questions? To learn more, please click the “Ask a Question” button on my profile to send me a message! It’s never too soon or too late to build up your musical abilities. If you have zero experience but want to learn, I can teach you how to use your voice or play the piano. Have you been studying with another teacher who taught you the basics and you’re ready to advance to a higher level? Are you self-taught and interested in refining your skills? I will help you take your piano playing to the next level. Are you ready to audition for a high school or community musical or opera? Have you performed covers or your own music at an open mic? Would you like to major in vocal performance in college or possibly become an opera singer? Do you really rock at karaoke? Are you already proficient on an instrument and want to branch out into singing? I can help you build on the foundation you’ve already developed. Are you, or would you like to be, a choir member at your school, church, temple, or community choir? I’ve been singing in choirs for almost thirty years! I can teach you any skill you need to know, from basic skills for beginners, to advanced skills for aspiring or working professionals. ***Who should NOT sign up for lessons: anyone who does not have the time, ability, and willingness to practice regularly. Sorry, it's the ONLY way to learn! I'm college educated in both classical music performance and English literature. In addition to teaching, I perform professionally as a singer, organist, and pianist with musical groups all over the greater L.A. area, including the Pacific Chorale, the Charles Dickens Carolers, Nova Vocal Ensemble, and many others. I'm happy to meet my students at any location near either Pacific Palisades or North Hollywood - I can teach music at any location with a piano. Contact me for more information. I look forward to meeting you! If you’re ready to start, click the green “Book With Me” button on my profile! *A note about availability - I keep this updated as accurately as possible, but because I travel over a wide area, your preferred time slot may not be possible for me, depending on the location of the lesson. Please contact me to discuss scheduling before you request a specific time slot. If you choose to take lessons at my home location, please be aware that I have cats. If you have a phobia or allergy, this location won't be suitable for you. Learn to play the king of all instruments! Receiving a degree in organ performance from Brigham Young University allows me to be on the cutting edge of all innovations in this area of the music industry. You won't ever get bored learning to play this instrument. It is a constant challenge but is incredibly rewarding. There are ways of expressing emotion and feeling emotion that can only be felt through music. I believe this is because music has the ability to connect all of us with the divine. My first priority with every student is to help them feel the music they are making on a level deeper than how the music works technically. Though I will never discount the importance of learning correct techniques and studying academic repertoire, there is nothing more important than learning how to express emotions through music and to perform in a way to allow others to feel moved by what is performed. m to express themselves in a way unlike anything else. I'm currently receiving a degree in organ performance from Brigham Young University and have taken many classes focusing on piano and organ pedagogy. I have years of teaching experience and have maintained a piano/organ studio since the age of fourteen. I currently serve as organist in my own religion and in another denomination. At a young age I caught on to the amazing power of music. I hope to help my students to do the same, not only by instilling in each of them a love and understanding of music but also by guiding them to find their own form of expression and feel their own connection to others through music. Levi is not only an excellent and qualified instructor, but also cares deeply and personally about each of his students. He has been a joy to work with. I am a beginning organ student and just learning the beauty of the sounds this wonderful instrument creates. Levi has helped me interpret hymns for church playing in a way I never before thought of or felt. He already has me playing half the hymns I play in church with the pedals. He pushes me “just right” to help me accomplish more than I would think possible. I highly recommend investing your future piano or organ abilities with Levi’s expert and thoughtful tutoring. Levi has been patient with me and supportive of my working through processes at my own pace.